Carriage light inspired hand-welded metal cap with cylindrical glass shade and metal ring detail. 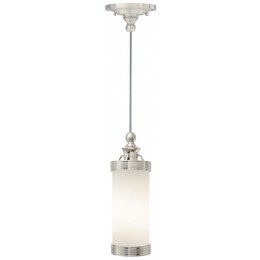 The Tech Lighting 600BRGPWS Bridgeport collection Pendant Lighting uses Incandescent light output and brings Antique style. This item is 11.5"H x 3.9"W. The total wattage is 60 and the voltage is 120 volts. The Tech Lighting 600BRGPWS requires 1 bulb (included). Additional Information: Shade-White Glass. Fixture includes six feet of field-cuttable cable.